The 2200-K is a loader crane designed for many different application possibilities. Whether the operator uses the crane for pure hook application or fits a grab, a pallet fork or other equipment, the HMF 2200-K is the right crane. The jib extension system is available with over-bending of 15° between the main boom and the jib. 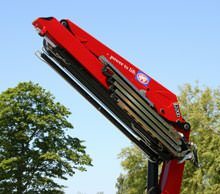 The crane has a dual Power Plus link arm system, which ensures an excellent lifting capacity and makes it particularly suitable both for lifting a heavy load close to the column and also lift bulky items at long reach and in high positions. All hydraulic hoses for stabilizer legs and beams are fed internally. This means that the HMF 2200-K has a clean and simple design and provides maximum protection of the hoses. HMF develops complete crane solutions. This means that each single crane type has been the subject of careful considerations during the development process in relation to functionality, operation and purpose, but it also means that each single aspect about functionality and operation is the basis for creating the CE Safety System RCL 5300. This intelligent safety system registers all activities and movements and the user can feel safe because the RCL 5300 protects the crane against overloading and stops the crane movements before the max. permissible load moment is being exceeded.